Oh, Ricotta Parmesan Gnocchi, how I do love thee. Cheezy little pillows. Melt in the mouth dumplings. Soft buttery morsels. Ok, you get the idea. These are so good, it’s hard to find the right words to describe them. And when they’re browned a little in butter, becoming crispy in places, they are perfect in every way. And then there is the Brown Butter Broccoli. What can I say, broccoli that has been cooked in butter until it almost falls apart and becomes caramelized in spots. Brown nutty flavored butter. It’s what they feed you in paradise. Now combine the Gnocchi and Broccoli, nestle it beside a salmon fillet, drizzle with brown butter, and you have the most beautiful and satisfying plate on the planet. Not kidding. To start the gnocchi, the ricotta is spread on paper towels to absorb excess liquid. The ricotta is mixed in the processor with eggs and parmesan. 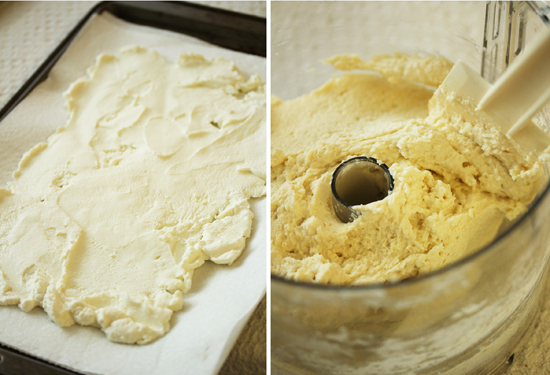 Flour is added and it becomes the consistency of mashed potatoes. The ricotta mixture is placed in a zip-top bag and a corner is cut off, so that 1-inch pieces can be cut off with a little knife and dropped into simmering water. After cooking for a few minutes, the gnocchi are placed on a lightly oiled baking sheet to cool. They can be eaten now, or frozen on plastic wrap and bagged to be cooked at a later time. This recipe makes a big bunch of gnocchi. You don’t thaw them out before cooking, but add the jewels right from the freezer. It is such a great feeling to know I have this item with so much potential in the freezer, just waiting to be cooked at a moment’s notice. Food security. A good thing. 1. Fill a large pot ¾ full of water and bring to a boil. Place 3 layers of paper towels on a baking sheet. Lightly oil a second baking sheet. 2. Spread ricotta on paper towels on sheet to absorb liquid, for about 20 minutes. 3. In a food processor, combine ricotta, eggs, parmesan, salt and pepper. Process until smooth. 4. Add flour and process until smooth. Transfer mixture to large zip-top plastic bag. 5. Reduce heat so water is simmering. Cut a ½-inch opening off a bottom corner of plastic bag. 6. 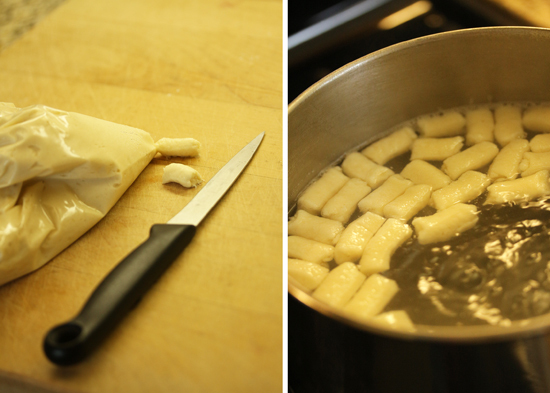 Over the simmering water, squeeze mixture out to 1-inch lengths and cut off with small knife, allowing gnocchi to fall into water. Repeat until surface is 1/3 covered with gnocchi. Cook about 3 minutes, until doubled in size. 7. With a skimmer or slotted spoon, transfer gnocchi to oiled sheet. Repeat with remaining gnocchi mixture. Set aside and allow to cool. 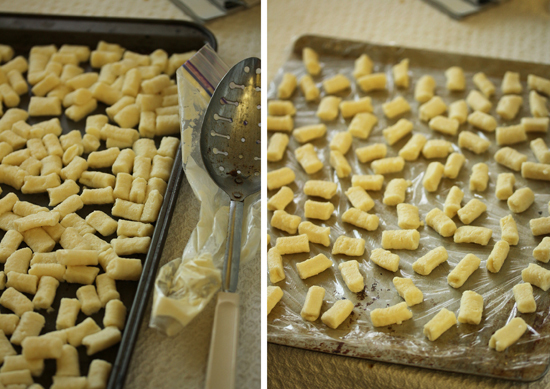 Note: You will not use all of gnocchi, and I recommend you freeze remainder on plastic wrap, not touching, on sheet pan. Store in freezer in freezer zip-top bag. To use, do not defrost. Cook frozen directly from freezer. 1. In a large non-stick skillet, melt butter over medium heat. Add the broccoli florets and toss to coat with butter. 2. Cook broccoli florets over medium to medium-low heat until soft and beginning to brown. Initially they will exude their liquid, then begin to caramelize in places. Butter should be browned with a nutty aroma. Sprinkle with a pinch of salt and pepper. 3. 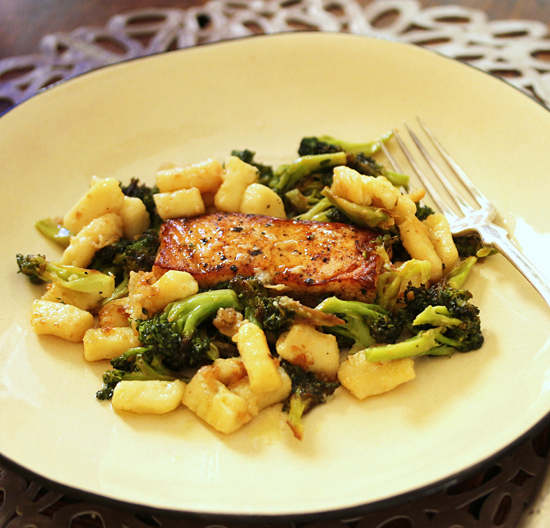 Push the broccoli to one side of the pan and add 1 to 2 cups of the gnocchi. Cook gnocchi, stirring occasionally, until beginning to have golden spots and are thoroughly warmed though. 4. 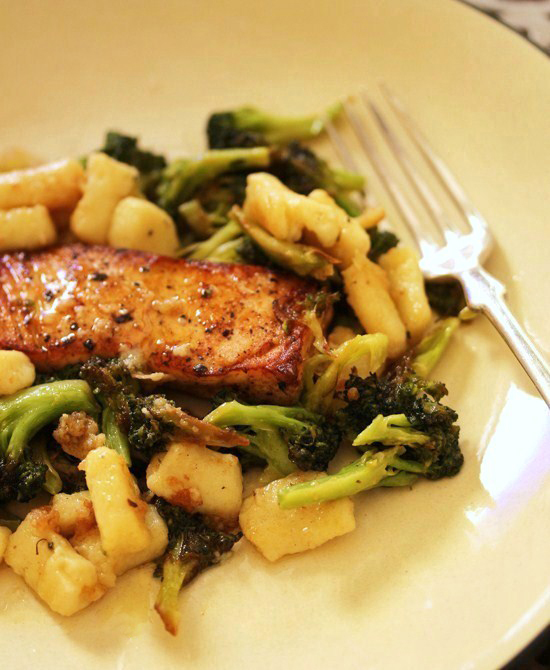 Mix gnocchi and broccoli together in pan. Adjust seasoning. With a slotted spoon, place on individual plates around protein of choice. Drizzle with desired amount of the brown butter. Ah, I used to make ricotta gnocchi years ago, and now I want yours! Gimme the gnocchi and no one gets hurt! Complimenti, what glorious food. This is desert island food for certain. This looks wonderful, Brava! I love that you put the gnocchi in a ziplock bag. How clever. You never can go wrong with brown butter on anything. Your meal is the perfect comfort food dinner to me. This looks fabulous and such a neat trick putting the dough in pastry bag…and that looks like brown butter salmon?….looks so yummy…thanks so much for sharing. Will definitely try this. I made ricotta gnocchi before, but they are well, fussy and temperamental children. So I am taking your Ziploc bag idea and running with it, along with the freezing idea Thanks for the tips. I’m excited for new ricotta gnocchi possibilities. Thanks Lynne, as always for a delicious looking meal and great ideas. Thanks you for the easy steps to follow and the fabulous pictures!